If there are two things I love in this world, it’s pompoms and my husband, Mark. 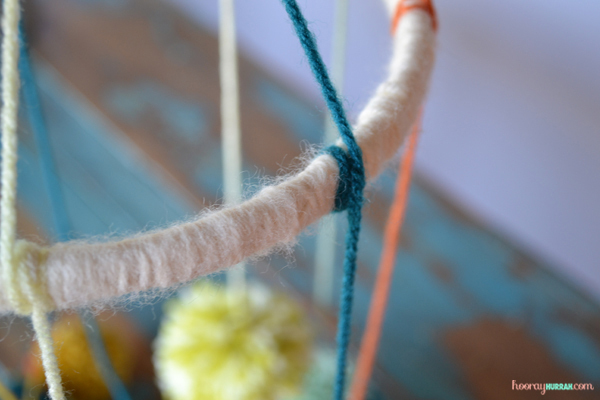 So today I am just pleased as punch to present a guest blog from Mark, where he will show all of you how to make your very own pompom mobile in six easy steps. What a treat! 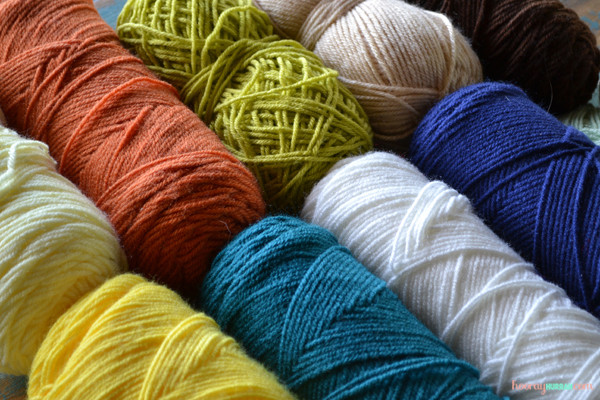 I like to knit. 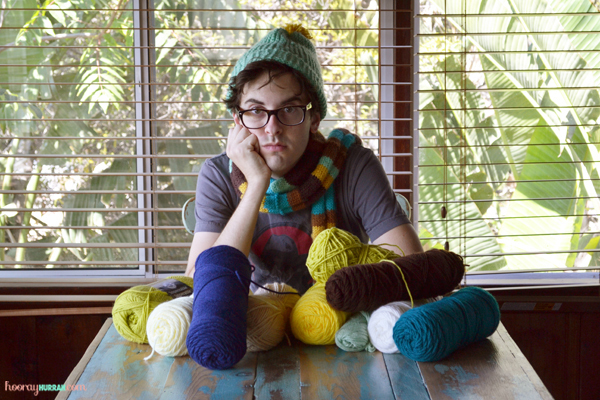 But with this darn Los Angeles sunshine, there’s not much use for a closet full of scarves and knit caps right now. So, I decided to take all that extra yarn I have lying around and make something that can be used all year long. 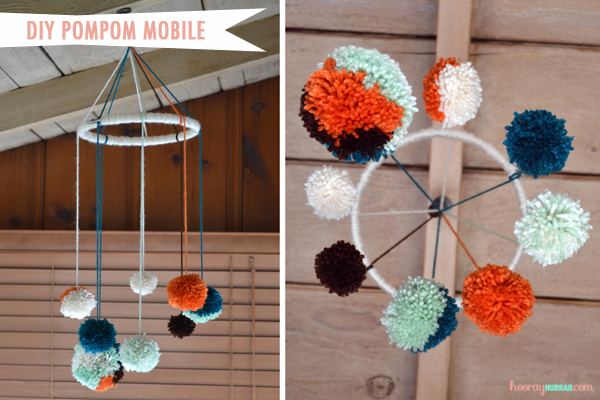 Say hello to the pompom mobile. Step 1: Pick your colors. This part’s easy. Unless you’re indecisive. Then it’s very difficult and will take many hours. 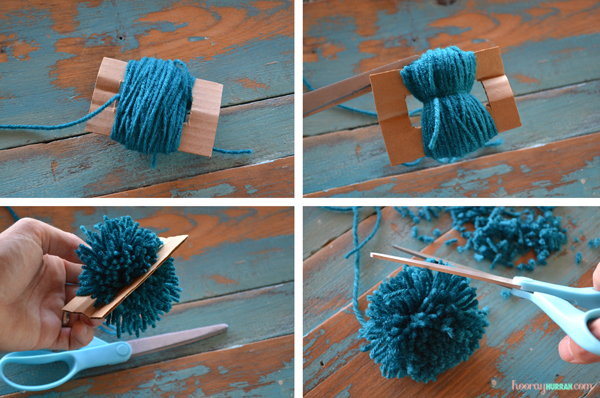 Step 2: Make your pompoms. 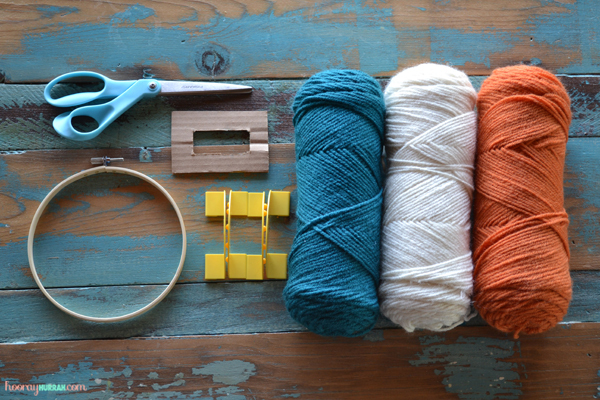 You can get a kit from your local craft store or make your own template by cutting a rectangle out of cardboard with a smaller rectangle inside, wrapping the yarn around it multiple times, tying it off through the opening, cutting along the edge, and trimming as necessary. 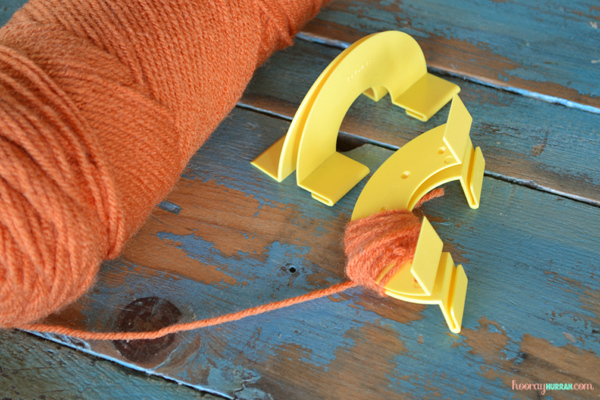 Make sure the piece of yarn you’re using to tie it off is extra long. These strands are going to come in handy later. For a 7-inch-wide mobile, I’d make about eight or nine pompoms of varying sizes and colors, but you don’t have to listen to me. I’m not your dad. Step 3: Wrap the hoop. 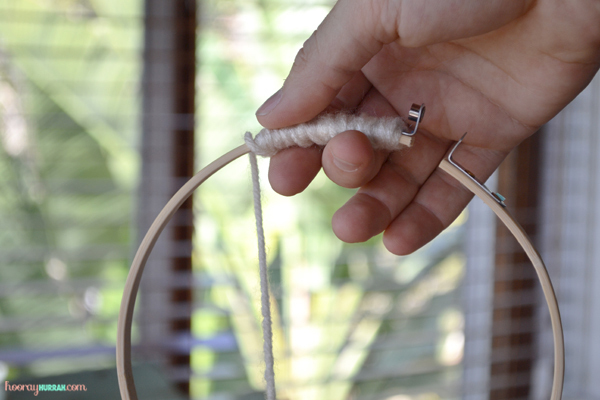 Unscrew the embroidery hoop and wrap your yarn around it until it’s completely covered. When you’re done, screw the hoop back together. Step 4: Pompom placement. Arrange the pompoms in whatever order you like by wrapping the long strands around the hoop, gathering them about a foot from the top and tying a knot. Step 5: Hang it up! Find an appropriate place to hang your new mobile. Try it over your desk, or your bed, or your baby’s crib. Pretty neat, yes? Think I can convince Mark to do some more guest blogs? 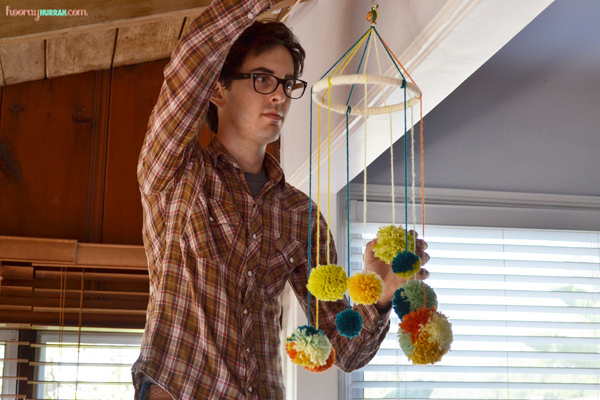 By the way, if you’re not the craftiest and still want a super cool pompom mobile of your own, you can also purchase one of Mark’s creations right here. P.S. Here’s my DIY pompom wrapping paper! 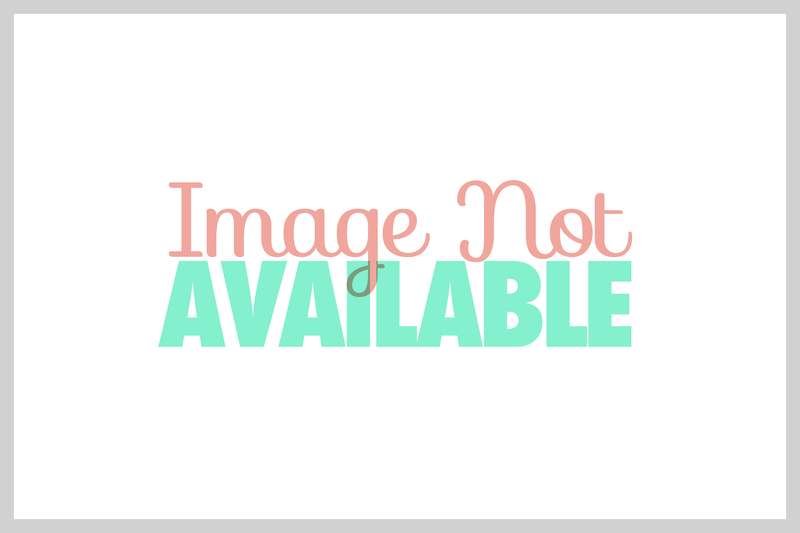 This entry was posted in Decor + DIY, DIY and tagged diy, diy decor, guest blog, husband, mark saul, mobile, pom, pompoms. Bookmark the permalink. What a fun project!!! So going to try it!! Love this! So excited to make one for my girl-on-the-way.